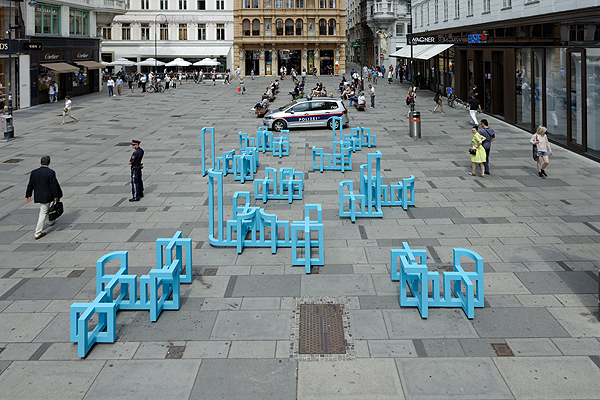 With the project Domestic Landscape 2.0 by Didier Fiúza Faustino, KÖR Vienna is once again transforming Vienna’s Graben into an art space and meeting place. 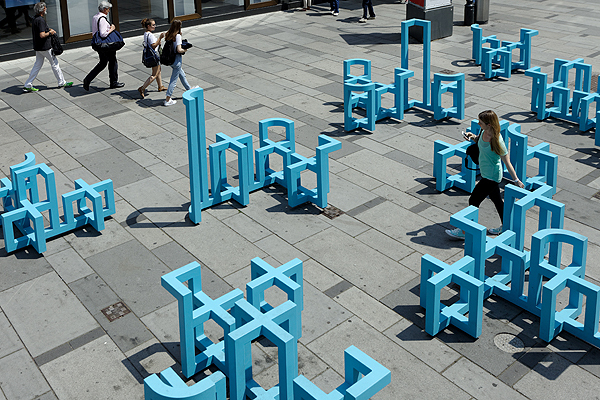 The installed urban furniture made of blue-painted steel invites those passing by to see this public space as open for their own personal use. 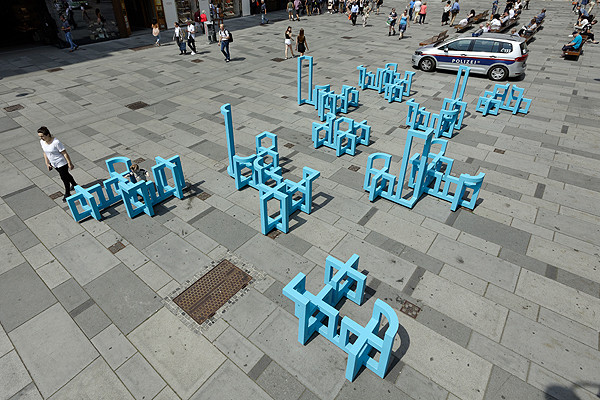 The sprawling intervention develops from a grid based on the form of a chair, which is multiplied as a matrix and then extended throughout the space. 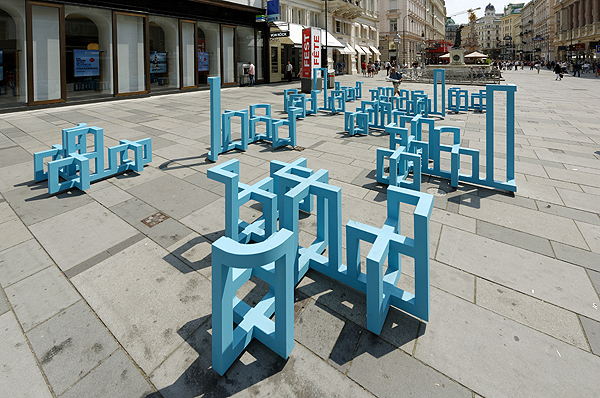 By adding a room divider and tables in two different heights, Faustino has generated a set of “furniture” that oscillates between utilitarian object and sculpture, creating an interior space within the outdoor space, a “home” in the city. The serial arrangement translates the domestic interior into a collective apparatus for the use of passers-by. Viewing himself as a citizen of the world, Faustino is interested in modifying and transforming the situation on the ground: proceeding from the classical notion of space with its coordinates height x width x depth, a structure grows that takes the form of a chair with a rounded or square backrest, which is at once a sculpture and a matrix that can be extended through the space. Faustino thus opens up the proverbial spatial box that goes back to René Descartes to draft a contemporary vision of space as a network of relationships. As in Henri Lefèbvre’s “Production of Space,” the imagined and conceived space conjoin here with the built environment to create a space for social use. Faustino creates with this “misfit” an open offering, but also a disruption of familiar ground. The interior brought outdoors initially seems irritating rather than fitting. And the chairs and tables here are not designed to be ergonomic and comfortable. But this state of irritation, the confusion of conventional codes and attributions, is a good way to encourage people to let themselves in for a new experience. Faustino wants to provoke a feeling of genuine connection and physical appropriation – an appropriation and ephemeral taking possession of the Vienna Graben. 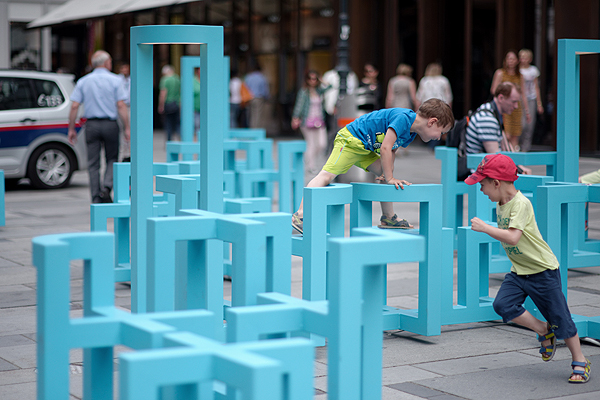 Who owns public space anyway? Multiple claims and ambitions overlap in the jointly and publicly “possessed” space, which is today no longer accessible to all. Real space is characterized by various ownership structures, commercial use and advertising, but also by a social “habitus” that differs from one context to the next. Today’s ubiquitous digital “second life,” the World Wide Web we carry around with us as we stare into our mobile devices, nearly blocks out the real surrounding space we move through. Domestic Landscape 2.0 squarely occupies the territory and once again creates a plaza where people will feel compelled to linger. 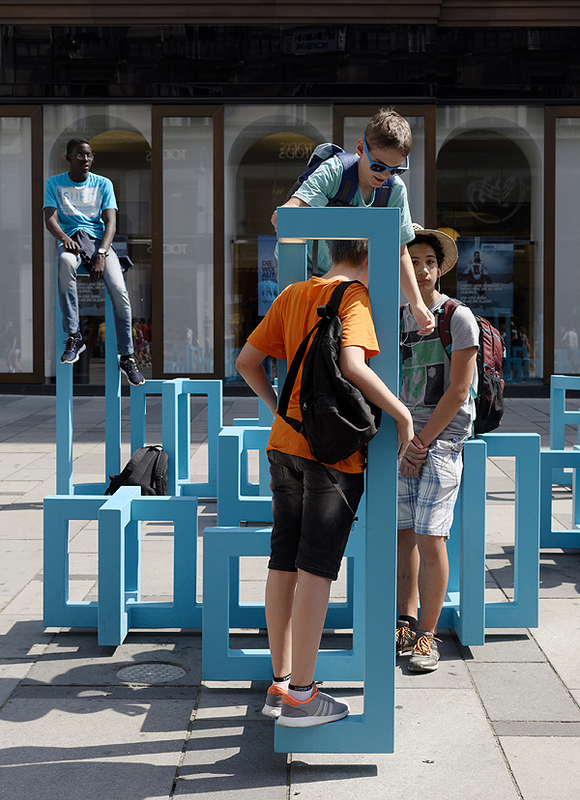 The temporary intervention literally puts itself in the way; it interrupts the hustle and bustle on the Graben and lures people to stop for a moment and enjoy an “analogue”experience, involving social interaction with other users as well as a give-and-take with the structure itself. Those who thus find themselves seizing this public realm for themselves again and making themselves at “home” in it are echoing the artist’s own emancipatory aspiration to reclaim the space. This is not a revolution but rather a change in familiar relations and our usual linear habits.